From the Foreword by Leslie B. Kadis, M.D. Twenty-five years ago the authors were all, relatively speaking, “professionally young.” The 25 years have added age, experience and wisdom to their words giving this volume an historical perspective into one aspect of the world of psychotherapy. On a personal note, preparing this book has taken me on an emotional ride. Mary was, no, is, a dear friend. She was literally a colleague when I, new to TA, was on the faculty of the Western Institute for Group and Family Therapy. As my mentor I remember the weekly discussions she, my wife Ruth McClendon, and I had on ex-tended walks through San Francisco in search of a new restaurant; we would talk about the merits of various approaches within TA (Transactional Analysis), about ITAA (International Transactional Analysis Association), and oh yes, politics at all levels. And she was a fan, supporter and promoter of our (Ruth and me) work in applications of Redecision Therapy to families at first and later, to family owned businesses. In preparing this book, the emotional ride was the result of reading each chapter, “hearing” the words of each author, and reliving my relationships with these vital people. It also opened the lid on that part of my life with Bob and Mary, and then with Mary. Perhaps I am too close to Mary’s death to be editing the volume that reflects her and Bob’s life work. But their child, Redecision Therapy, is all about understanding and managing emotions, so let’s get on with it. One thing that is most striking is the freshness of the articles. George Deabill (Gay Issues in Psychotherapy, p. 90) expressed this sentiment clearly: “I re-read this paper for a new publication and I did not want to change anything. What I wrote in 1985 still seems to fit in 2008.” That could be said for virtually all of the articles reprinted. 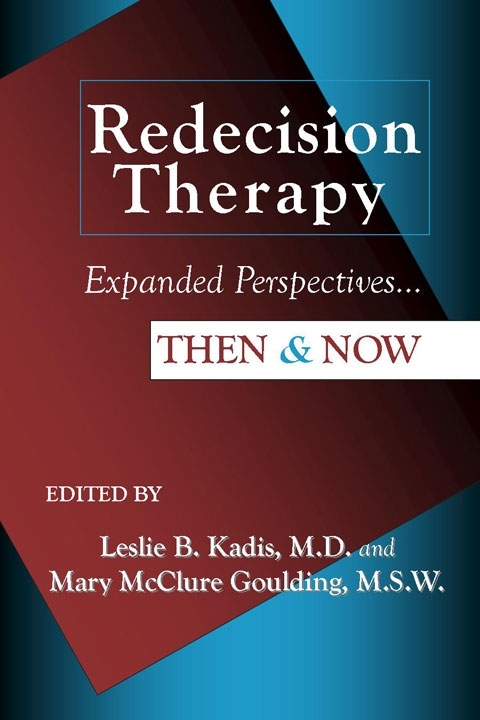 I took special pleasure in reading the contributions from Mary and from Bob (History of Redecision Therapy, Alcoholic Dependency and Denial, Redecision Exercises, p. 100). There are always several perspectives. Bobs perspective, “ground zero” of Redecision Therapy is the one to refer to when trying to understand the meaning of the process. I thought, how prescient, Redecision is really a forerunner of cognitive-behavior therapy (CBT); the disruptive feeling rooted in the Child ego state is associated with an irrational thought(s) and the Redecision effectively replaces the irrational with a new updated cognition. In Redecision Exercises, p. 34, Mary’s creative Child jumped off the page. I felt as if I were back in the group room on the Mountain. No doubt charisma played a role in Bob and Mary’s success but the articles by St. Germaine and O’Connor, p. 4, and Steele, p. 156, remind us that their work was based on a solid knowledge of human behavior. Many of the articles address applications of Redecision Therapy to select populations; children, couples, family businesses, people with paranoid and multiple personality disorder and PTSD. The list goes on reflecting the richness of Redecision Therapy. Each of the articles contains at least one “pearl”, many contain several. But I had to comment on Bob’s article, Alcoholic Dependency and Denial, p. 100, recounting his personal struggle with alcohol de-pendency. In it he does what he teaches, he instructs from his Adult, limits from his Parent, all the while engaging his Child in his move to recovery. The choice of which articles to include and which to update was at first Mary’s, but ultimately mine. The decision was made to keep this volume fresh and relevant to today’s world, rather than historical, and to that end some articles are taken, with permission, from the October, 1995 Transactional Analysis Journal on Redecision Therapy. Some are new.